Scouts are active in the Wick area and in Caithness. Beavers is for boys or girls from six to eight (6-8) years of age; Cubs is for boys from eight to ten and a half (8-10.5) years of age; Scouts is for boys or girls from ten and a half to fourteen (10.5 - 14) years of age; and Explorer Scouts is for boys or girls from fourteen to eighteen (14 - 18). All the groups encourage the development of both co-operative and individual skills and foster a sense of belonging and achievement. If you would like to contact a group leader to enquire about a place for your child in the Scout movement or about Scouts in general please contact the appropriate leader. Scouts is a non-profit volunteer organisation. If you have skills to share or if you would like to volunteer your time either occasionally, as a leader, or as part of the executive please contact one or all of the leaders. 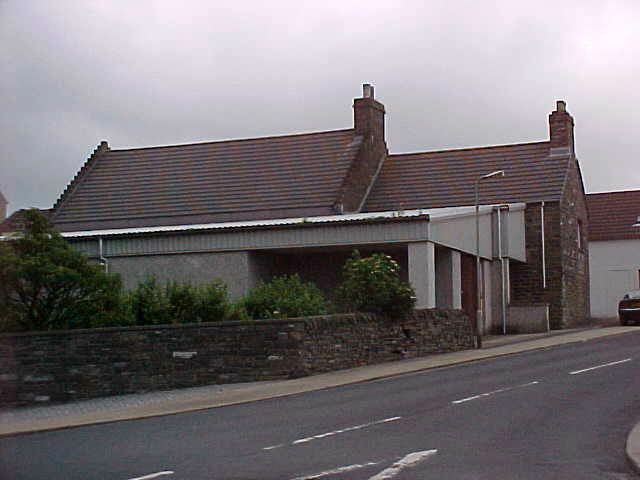 A climbing wall had been installed in the Wick Scout Hall and was occasionally used until 3 or 4 years ago. Not many other scouting groups in the area knew about the facility and weren’t using it. It was decided to get the climbing wall reinstated so that the young scouts could get some experience of climbing in a safe warm environment. 1st Caithness, 1st Wick Scouts with the aid of the BTCV Scotland (BTCV.org) and George Gunn, Master Dry Stone Waller, have begun transforming the adjacent grounds at the Scout Hall. Explorer Scouts applied for the opportunity to work with the BTCV under Leader Plus and under consultation with Scouts, Cubs and Beavers created a design for the garden. Over 7 tonnes of local Caithness Flag stone was brought in and under the watchful eye of George Gunn and the BTCV Volunteers the Explorer Scouts and Scouts learned the art of Dry Stone Walling. They creating a large raised planting area, a seating area and a 'Tomb Stone' style fire pit. It has been a great opportunity for the Scouts to learn new skills and to help improve their local environment. Caithness Scouts At Blair Atholl this year got a taste of much bigger things to come as the Scottish Scouting movement gets ready in coming years to host the European Scout Jamboree to be followed by the biggest scouting event that takes place - The International World Scout Jamboree. From Blair Atholl Caithness Scouts brought home some Polish scouts to see Caithness. Exiting times ahead for Scouts in Scotland. On July 9th to 11th, 1st Caithness, 1st Wick Scouts enjoyed a busy weekend camp at Bettyhill, Sutherland. Two Cub Scouts and a Beaver Scout accompanied the 12 Scouts and four Explorer Scouts. The Scouts were responsible for setting up camp, camp maintenance and their own cooking. They still managed to find time to explore both local beaches where they played different wide games, enjoy a swim at the local pool, enjoy two entertaining campfires and explore Borgie Forest. It was not all fun and games, supported by the Forestry Commission the Scouts planted 100 trees to help improve the local environment. Steven Fraser, Forester for Caithness and Sutherland taught the Scouts how to identify some of the local tress and took the Scouts for a ride on the Argocat an all terrain vehicle, which became one of the highlights of the camp. After two nights of camping many of the Scouts earned the next stage of their Nights Away Award. Ten Scouts earned their The Outdoor Challenge and the remaining Scouts only need to sleep in a bivouac for a night to earn their The Outdoor Plus Challenge. The Scouts should all be commended for their hard work, which made the camp very educational and entertaining. As part of Midsummer Madness, 1st Caithness, 1st Wick Scouts went on an evening cycle run to Rumster Forest. The Scouts enjoyed exploring Rumster Forest and some of the new trails that have been built by The Forestry Commission to create a fun and challenging circle route that can be enjoyed by cyclists of all abilities. After the run the Scouts enjoyed a snack before being given a short talk on forest management by Steven Fraser. It was a great evening out and one that the Scouts hope to repeat in the future. Wick Scouts were out to help Bill from Caithness.org do some fund raising for Marie Curie Cancer Care at Safeways supermarket in Wick. A couple of the boys hare old hands having helped last year. So thanks to all the boys and their leaders for helping out once again. 1st Wick Scouts is growing, and with the recent increase in numbers we need adults willing to help. If you have a skill you would like to share (canoeing, abseiling, crafts etc), would like to help on the committee or would like to become a Scout, Cub or Beaver Leader please contact the Scouts on wick_scouts@yahoo.co.uk or visit us on Friday evenings 7-9:00 at the Wick Scout Hall on Kirk Hill. Six Scouts from Wick and Thurso have recently returned home after attending the Scottish International Jamborette at Blair Atholl which ran from July 15 to July 26 2002. All Scouts successfully completed 14 challenges and earned the "Challenge of the White Cockade". As part of the international experience, the Caithness Scouts are billeting 1 Canadian and 3 Austrian Scouts during their visit.